Soak up the atmosphere of the place on a hiking tour. Start the day by picking you up at your hotel in central London, or meet your professional guide at the agreed meeting point at Victoria Bus Station to start your tour. Hop aboard your first-class luxury bus and relax as you head northwest, away from the bustle of England's capital. The first stop on the tour is Oxford. Known as the City of Dream Needles, Oxford is home to the oldest university in the English-speaking world. Upon arrival, get off your bus and enjoy a walk through the city centre with your guide. Plug in modern headphones and listen to your guide explain clearly as you walk past the elegant, old buildings and patios that have inspired generations of students, including Bill Clinton and his daughter Chelsea, Hugh Grant and Kate Beckinsale. You'll see the Bodleian Library and Christ Church College, where Albert Einstein studied and some scenes from Harry Potter were filmed. 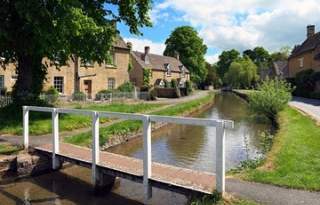 You will then make a short stop for a snack (not included in the price) before getting back on the bus and travelling through the rolling hills of the Cotswolds, an area steeped in English beauty, history and heritage. Look out the window to admire the straw-roofed cabins and the charming inns. Arriving in Stratford-upon-Avon, home of the famous playwright William Shakespeare, visit his Tudor-style home with its typical living room, bedrooms, kitchen and pantry. Enjoy some free time for lunch (not included in the price) at one of the many restaurants. You will then make a short drive to the medieval castle of Warwick, whose magnificent towers and walls remain almost intact. You will travel through 1000 years of history as you cross the catwalk to a world past of banquets, battles and ceremonies. Climb up to the princess' winding tower or, if you dare, visit the creepy dungeons where the prisoners were tortured. If you wish, you can take a stroll through the castle's charming gardens, where archery, falconry and medieval jousting competitions are held in summer. Your one-day excursion ends back at Victoria bus station in the evening. The tour departs from Victoria Coach Station. Hotel pick-up service available at some hotels in central London.